Social media optimization (SMO) is a series of methods used to increase social media engagement, drive website traffic, and boost conversions via sign-ups or purchases. Any business that would benefit from engagement and lead generation on social media should engage in SMO. Successful optimization leads to increased brand awareness, engagement, and conversions. Some businesses have the budget and resources to run a time-consuming and continual social media optimization strategy. Those that don’t turn to brands like Hibu to outsource the process, a company experienced in setting and reaching social media goals. To learn more about Hibu, click on “Get Started” from their homepage. SMO requires setting measurable marketing goals, then fine-tuning them to increase follower engagement and conversions. This involves sharing branded content that meets target market needs, engaging your industry to grow brand interest and, lastly, driving social media traffic to website conversion funnels. By learning what works and doing more of it throughout this process, you grow your audience and conversions continually. With the use of core branding elements like a style guide, businesses build high-impact social media profiles, and then analyze their impact and reach alongside competitors. Using this data, along with keyword research, they then optimize their social media accounts for higher engagement, optimize their websites for higher conversions and fine-tune their target audiences for effective social media reach. A successful SMO strategy is ongoing but will increase the return on investment (ROI) significantly for social-focused businesses. The specific success metric will depend on a business’ marketing and social goals but can include the doubling of engagement or following, a notable percentage increase in click-throughs on websites or landing pages and increased sales. SMO is for business-to-business (B2B), business-to-consumer (B2C) and nonprofit organizations with significant social presence interested in increasing leads and sales through social channels. Because the purpose of SMO is to generate qualified leads, you want to guide them into your conversion funnel by directing social media users to your website. 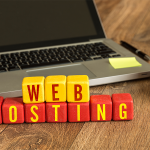 Businesses should have an established digital presence — both an existing website and profiles on one more social media platforms. Here are three businesses SMO is right for. More than 70 percent of even small businesses use social media to engage with partners and consumers. From service-based firms dedicated to accounting and law to content creation, technology and manufacturing firms, SMO can help tap into the lead-generating potential of social media platforms. This builds brand awareness while moving leads through a conversion funnel. Approximately 216 million people in the United States are projected to be on social media platforms by 2021. In 2017, 1.66 billion people made online purchases. In a fast-paced, mobile-first world, this means social media platforms offer B2C brands the opportunity to reach consumers wherever they are, 24/7, and then drive that traffic through website conversion funnels. Today’s social media platforms are gravitating toward filling feeds with stories. Live video, story capabilities, long-form blog features, hashtags and more help consumers follow the stories that mean something to them. SMO allows nonprofits to engage in these conversations and spread cause-related awareness that leads to donations. SMO begins with creating a clear brand style, voice and presence across all social channels. Businesses then should conduct in-house and competitor analysis to determine what audiences are underserved and how they can best address their pain points and needs. Keyword research and website optimization complete the SMO process. Here are nine steps to implement a successful SMO strategy. A social media style guide is a collection of all guidelines for messaging, voice and tone, design and style that helps brands create a consistent, accessible presence across all social media platforms. It is grounded in your mission statement and brand persona. Here are the steps to creating an effective style guide. Your mission statement defines how your business aims to meet customers’ needs. It should clearly and concisely define how you represent your brand before existing and potential customers online. If you don’t have a mission statement, check out our guide on How to Write a Mission Statement in 6 Steps. A brand persona is your brand’s online personality and should be a reflection of your mission statement. To create a persona that can be envisioned easily, think about your brand as a person. What would they look like? How would they speak? How would they dress? This brand persona should be conveyed in how you engage followers and customers, the content you create, the voice of your messaging and design of your social media profiles. Five key components should guide your social media style: voice, tone, color palette, design components and logo usage policies. By aligning these components with your mission statement and brand persona, you ensure a consistent online impression. A competitor analysis helps you understand what your industry audience wants and how you can deliver it. First, search common customer questions online to learn who your competitors are. Then, use social media analytics to learn what works and what doesn’t among them. Lastly, craft your competitive advantage and SMO goals from there. Here are three steps to completing a competitor analysis. Start by Googling common questions your customers ask about your products, services and business. Remember to include questions about where to purchase your products. If you are a local garage, for example, you may not be competing with a garage three states away. So, don’t forget to search for your business type, products and services in the areas you serve. Make a list of businesses that appear as a result of your searches. Once you’ve compiled a list of three to five key competitors, visit their websites and look for invitations to join them on social media. If they have social media profile buttons, click on them and begin listing the URLs of each competitor’s social media pages. If you can’t find any social media invites on their websites, search for them on the social media platforms where your business has or would like to have business profiles. Analyzing your competitors’ performance begins with reviewing common metrics like follower counts, likes, comments and reshares. There are tools to help streamline this process, but it can be done manually as well. By reviewing this information, you can see what content resonates with their target audience and how you might be able to create and share similar types of content. Here are five key competitor metrics worth analyzing. Dig into competitor audiences to understand who comprises their followership, including demographics like age, location, income level, likes and dislikes and gender. Also, look at their numbers over time. After running campaigns, for example, how many followers do they gain? Are there certain seasons or days when they gain or lose more? Learn the types of posts competitors publish. For example, are there videos, images, GIFs, links, quotes or reshares in the posts? How many of each do they post on an average week? By comparing these post types with engagement that they get, you can understand what your competition is doing right and what content is falling flat. Analyze how many likes competitors get by day of the week, post type and demographics. This will inform what to post, when, and who to target. Do some post types get more comments than others? This is important because comments allow businesses to interact one-on-one in meaningful ways with followers, building trust and loyalty. By analyzing reshares, you learn what you can do to boost brand awareness among your followers’ audiences. If certain types of posts or posts at certain times resonate enough to garner reshares, you stand to gain powerful word-of-mouth marketing be creating similar content on your channels. Quintly offers an analytics platform that works very well for benchmarking across all your social media platforms. It offers more than 350 metrics to choose from, but you can also select one of its premade benchmarking templates with key metrics. You can also combine its metrics with new ones that make sense for your brand. Your competitor analysis should have provided deep insights into competitor audiences and the strategies to reach, engage and convert them. Next, pinpoint which competitor audiences are relevant to your brand. Then, extract insights regarding what you can do better than the competition and how to compete for these target markets’ loyalty. Finally, set SMART (specific, measurable, achievable, relevant and time-bound) goals to strengthen your brand and build consumer loyalty for greater website conversions. Here are three steps to set achievable goals for your SMO. Some competitors’ target consumers who are not a good fit for your brand offerings. For example, your shoe company may only sell adult shoes while your competitor also sells children’s shoes. In this case, you wouldn’t want to use your competitor’s strategies to attract parents with small children. So, narrow down your competitors’ target market lists to reflect your target market only. Then, only employ strategies that are relevant to those target markets. Of their target markets, who would not be at all interested in what I sell? Of their target markets, who would not find my offerings an ideal fit for their preferences or needs? By analyzing your competitors’ target markets, you can determine what goals you need to set for your target market. Begin by listing what your competitors do to attract their target audiences, including types of content, publishing schedules and types of advertising they employ. What do my competitors do that creates more engagement in the form of shares, likes or comments? At what times or days do competitor posts perform best? What types of competitor-shared posts perform best? What competitor actions create an influx of new followers or drop-offs? Who engages most with posts in general, then by post type and time of publishing? What segment or segments of my target audience do my competitors engage better than I do? Would mimicking the high-engagement posting types or schedules of my competitors help me boost engagement? How do they boost my target audiences’ brand awareness by garnering reshares? What content most creates reshares? How do they boost commenting? How can I mimic this strategy to boost loyalty-forming one-on-one interactions with followers? The answers to these questions will ultimately increase engagement and conversions by giving you the foundation for concrete goals. You may learn, for example, that by posting more live videos on Facebook, you can garner more comments and more opportunities for one-on-one relationship-building interactions with target audiences. Having SMART goals in place is the best step-by-step strategy for setting your social media goals. For manageability, start by setting one or two goals, but make them very actionable and keep yourself accountable by being very specific. The following graphic guides you through creating SMART goals. In addition, our article on creating SMART goals gives you examples to guide you. Keyword and hashtag research is a process of determining which words and phrases are most searched for content related to your industry. Knowing these, you can add the right keywords on your profile and increase engagement of your target audience. Keyword research is a way to determine the words and phrases most frequently used to look for content related to your business. Today’s consumers rely on social media as a type of search engine for this purpose. After their search, they consume content that best meets their needs, while connecting them with new brands and profiles. For this reason, it’s important to infuse your social media profiles with the keywords people use to search for content related to your industry. Your competitor analysis helps you do this by understanding who your target audience is and what they’re looking for. Make a list of your target markets. Make a list of customer questions you commonly receive about your offerings. Begin typing them into Google and see what suggested keywords it offers as you type. Plug them into a keyword analytics like Moz Keyword Explorer to learn which keywords outperform them. Plug the highest performing keywords into your social media content and profile as appropriate. Moz helps you determine how well your current keywords perform and what keywords might perform better. Create an account to start using the tool for free. Hashtag research is an analysis of what hashtags related to your industry are most widely used. By helping you tap into industry conversations target markets are having, these hashtags help you expand your reach and awareness. Moreover, engaging with the right hashtags sends a message to followers that you care about what they care about. To be effective in managing hashtag usage and engagement, brands must narrow their focus. Be sure to prioritize the ones that same most relevant to your business. There are many free tools on the market to help you gauge which hashtags are most relevant to your target markets. Hashtagify is one such tool. You can input a search term for free, then receive reports regarding its popularity, recent performance, performance over a week or month and popular related hashtags. You can even view influencers who use the hashtag and the hashtag’s performance by language and geography. Using the collected data from research and analysis, reconfigure your business name, images, bio information and business information to target popular search terms. Be sure to include key elements in your profile, such as your logo, popular keywords and branded design. Here are four profile elements to optimize in all of your social media profiles. Make sure your name is optimized by listing exactly what people would search if they knew your business by name while avoiding nicknames or shortened names. This is important as many people search for businesses by their proper names when they don’t know business handles. To increase visibility, this is also a good place to include a keyword your target markets would search for to find you. For example, if you have an antique shop, include your name, then “antiques.” Be sure the keyword you use is not one that would become irrelevant over time. It has to describe your product, services or business for the duration of your online business presence. Your profile image should be your logo. If you are an entrepreneur and don’t yet have a logo, a consistent headshot should be displayed across all social media channels and on your website. Consider using headshot and logo backgrounds that align with your brand colors. If you have the option of including a cover image, choose one you can use across consistently platforms and one that aligns with your color palette, so your brand is recognizable easily. If you have a brick-and-mortar establishment, including this image as the cover image helps locals recognize your brand when they search for it, building familiarity and reducing confusion for those who wish to purchase in-store. In your bio, use the most relevant keywords to describe your business. You’ve already done keyword research to learn which keywords work and which don’t when describing your business. Stick to the most-searched keywords as much as possible. When possible, include a link to your website or campaign landing page. Then, include the hashtag #LinkInBio on campaign content to help followers connect the dots. If you have chosen a branded hashtag, include it in your bio as well so it’s easily accessible to current or potential followers who want to learn more about your social media presence across platforms. Many business platforms, including Facebook, Instagram and LinkedIn, allow you to provide business information like your physical address, phone number and email address. It is essential you fill this out completely. Even if you’re a virtual business, many people prefer to purchase from local businesses. Including this information helps you appear before local buyers who are more likely to purchase from you. Keep this information updated completely at all times. Before creating content on your website, install social buttons for easy sharing. Also be sure your content and display or mobile-responsiveness are in line with your social media campaigns. Remember, you want people to have a seamless experience from social media through website engagement. Here are four ways to optimize your website and its content for social media. Focus on including sharing buttons from social channels most likely to drive website engagement. To determine this, look at your analytics to decide which social media platforms drive the most traffic to your website. In addition, consider what platform best showcases your products or services and connects you to target audiences. If you are a tech brand offering services to other businesses, LinkedIn is a good place to start as that’s where many business brands look for other businesses partners. If you’re a nail salon, your products are art and should be showcased via visual assets like images and videos. Instagram, YouTube or Pinterest would be ideal platforms in this case. Once you’ve chosen which buttons to include, add them on all content pages you wish to be shared from your website. Be sure to provide all the opportunities possible for readers to use them by making them “sticky,” meaning they move with the readers as they scroll through your content. Since roughly 80 percent of traffic to websites originates in social media apps on mobile devices, your website should be mobile-responsive. 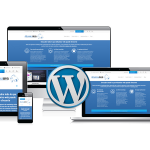 WordPress offers many device-responsive themes to choose from so your social media followers are never left frustrated when they finally click through. To lead target markets from your social media campaigns to your website and through the path to conversion, it’s best to lead them directly to a relevant landing page created specifically for your social media campaign. A promotion for an event, for instance, should lead directly to an event details page and not to a generic website. Unbounce offers the tools a beginner or advanced marketer would need to create relevant landing pages. It offers a 30-day free trial for all paid plans, which start as low as $79 per month for 75 monthly landing pages. In your follower’s eyes, quality content is content that meets their needs. When you align your content production with your audience-centered goals, you position your brand as an authority that can be trusted with a purchase. This alignment entails including what followers like of other brands’ content, filling content gaps to boost underengaged audiences and even reaching externally to solve the problems nonfollowing target audiences face. Your goal now should be to produce content unique to your brand that meets the goals established by research and analysis. This content should be targeted at a specific audience and directly address their pain points, needs or wants. What questions would my target audience still have after consuming competitor content? What expertise can I offer my target markets that my competitor can’t? 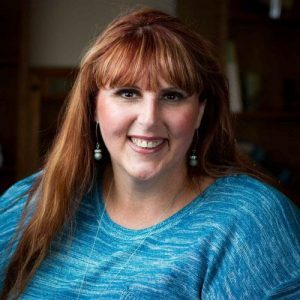 What resources like templates, checklists and more can I offer target markets that my competitors haven’t? By analyzing competitors’ followers, you know the needs of audiences that are under-engaged by your competitors. This is a primary target for your marketing efforts on social media. Using the same research steps outlined above for keywords and hashtags, determine what this audience is looking for and create content around it. To extend your reach beyond your audience, target new audiences with characteristics similar to your existing following. First, pay to promote your high-performing posts and target these audiences. Second, help your website content become part of the industry conversation by contributing value in industry groups, and then linking back to your site. In both tactics, your blog posts reach new social media target audiences, potentially creating new followers and driving traffic back to your website. Here are ways to engage similar external social media audiences to drive traffic to your website. Many social media platforms help you promote your posts beyond your immediate following. 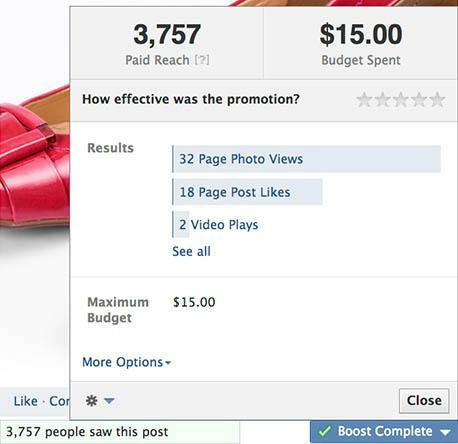 For example, if you promote your post on Facebook, you can choose to promote it among your followers and their friends. It will not only will it appear in your followers’ News Feeds but in their friends’ News Feeds as well. This increases in engagement, following and brand awareness. 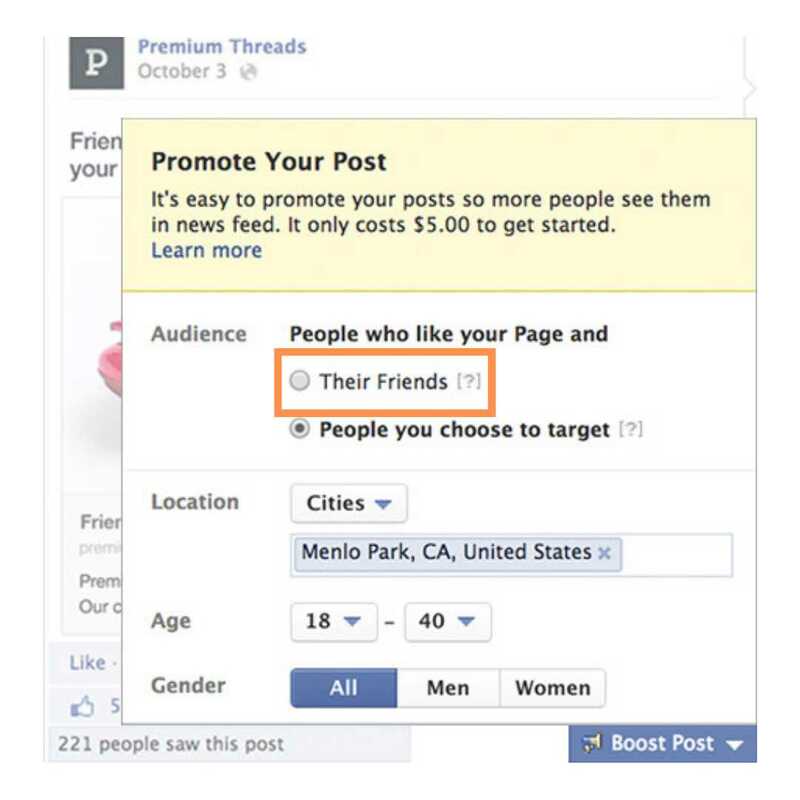 For example, the ability to promote posts on Facebook are available to business pages with 50 or more followers. If you take the smallest possible audience — 50 people — and assume each has an average of 100 followers, which is a low average, you’ve just expanded your reach by 5,000 people. Choosing an audience for Facebook Sponsored Posts. For a full step-by-step guide, read our article on Facebook Sponsored Posts. By engaging in industry conversations, then finding ways to incorporate your website posts into them in valuable and audience-centric ways, you grow your social media following and, when they click on your post, you ultimately drive social media traffic back to your website. Here is how to market your content to external social audiences to drive website traffic. When you assign hashtags to relevant posts, you lend value to the broader conversation happening around them. As you do, your post can potentially be seen by hundreds of thousands of people via replies and reshares. You’ve already researched which hashtags your most valuable audiences use and follow. Pair them with content that lends value to current industry conversations and let them go to work, bringing your content before target audiences. You can add equal value to industry conversations by using your posts to ask and answer questions in industry-specific social media groups, namely influencer and industry groups on LinkedIn. Be sure not to overpost, however. The only time you should share a website blog post in a group conversation is if it truly answers questions posed by the group, helping them instead of solely promoting your brand. Overly self-promotional content could get you deleted from groups if they’re viewed as spam. The goal of SMO should be to grow your social media following, then continually drive traffic back to your website, helping you to feed new leads into your conversion funnel. However, an SMO strategy that worked six months ago may not work today as customer expectations and needs shift. For this reason, this guide is not a set-it-and-forget-it process but must be practiced continually in a cyclical process if you’re to achieve long-term success. Although your style guide should remain relatively consistent throughout the life of your brand, or at least evolve slowly and subtly, your optimization process should be changing constantly. For continual and long-term growth, we recommend conducting a quarterly competitive analysis, Then, use those results to inform strategies that will resonate with your target audiences and their preferences. So, once you’ve completed step 9, go back to step 2 and begin again. What Is the Difference Between SMO and SEM? Search engine marketing (SEM) is paying for ads to appear on search engine results pages like Google and Bing when people search relevant keywords related to your products or services. SMO is the process of increasing your social media presence with the purpose of directing qualified leads to your website. Search engine optimization (SEO) encompasses the strategy used to grow website visitors by helping people find you on search engines like Google, Bing and Yahoo. The goal is to rank high on these engines for greater visibility. SMO is using your social media profiles to drive traffic to your website. You must first grow traffic to social media profiles, and then direct that traffic to your website with compelling content and social media experiences. Social media marketing (SMM) is business marketing primarily focused on social media channels. This is primarily for social media-focused businesses with a goal to increase brand awareness and engagement within social media platforms. The goal of SMO should be to drive social media users to your website continuously so they can convert. This means building your social media following, increasing their interest in your business offerings via relevant and quality interactions and content, reaching out to similar external social media users to spread awareness and earn leads and optimizing the ongoing process, from biography creation to advertising via informed benchmarking goals.